Extra space can be hard to come by — especially in San Francisco — whether you’re in your own building or traveling to events. If you’re looking to maximize your available area without sacrificing the impact of your brand, you’ll be happy to know that custom retractable banners offer an excellent blend of versatility and portability. SpeedPro Imaging Marin can offer you not only a wide range of options but also skilled and passionate experts. As a partner of the nation’s biggest large-format graphics producer, we’re confident that we can assist with all of your requirements. We’ve provided services to clients throughout the Bay Area for a while now, which gives us insights into the local economy that other competitors might struggle to match. When you pack up your traveling display for a trip to a trade show, festival, concert or other location, you’ll only have so much space to fit essential accessories. If you need to get the most for your money, remember that companies often employ retractable stands due to how compact and effective they are. These products also tout durable construction, which allows them to handle the rigors of the road. You can use retractable stands in many different scenarios to extend your brand reach and expand your customer base. You can employ these banners as seasonal tools at auto dealerships, retail stores, malls and other locations that cycle through frequent promotions. Ultimately, it will be up to you to determine the best application, and we’ll listen to every detail at our initial consultation session. As we take in your specifications and entertain your requests, we can gain a better idea of what products to recommend out of our diverse catalog. The stands we offer come in multiple styles, and you can customize the internal mechanisms, sizes and metal gauges. Style-wise, we offer three primary options — retractable, telescopic and spring-back. We also provide three kinds of models, which are economy, standard and premium. The pros and cons of each option will vary, but they’re all specifically geared toward one particular application. Economy models, for example, keep costs down with lower-grade mechanisms and metal gauges. 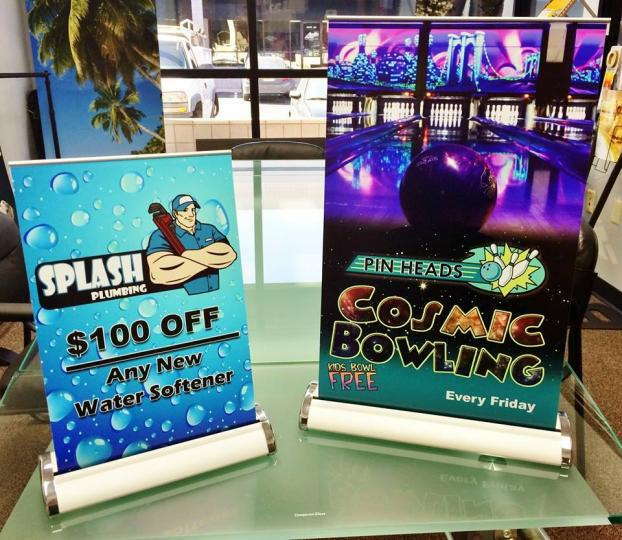 They’ll still function reliably and display your banners with little issue, but they’re more suited for the occasional use at car dealerships, retail locations and similar venues. Premium models are a traveler’s dream, as their top-of-the-line construction makes them tough and reliable for frequent conversions and travel. With all that in mind, we take pride in producing retractable banner stands that all offer portability and ease of use. In terms of the banners themselves, long-lasting inks and durable materials will keep them vibrant for the foreseeable future. Arrange your consultation with us today. You can also visit our studio, which is located on Francisco Boulevard East in San Rafael.